I could have run a little bit more than 29km, but I had reached back home and I didn’t at that point have the creativity to figure out where else to go. I remember getting to Pill, just next to Easton-on-Gordano, and running past a playground and down a path before weaving away from a family on bikes – it was 14.28km in and while I’d been aiming for 15km in order to make it an even 30km, my knees decided that it was not a good idea so I turned back. I had my first session on my knees on 1 February and as the physio guy likes to remind me, my left leg was in poor form and my right extremely poor. I had some nights where I would wake up in the middle in order to apply ice. I would wake and fall asleep with the thought of the ache. I now have to remind myself that I used to hurt. Discomfort is a funny thing. I have put so much effort into building up my right leg that at 6km into the run on Sunday it was the other knee that started hurting. I noticed it, wondered if it was just a passing thing, and then I kept running. I had run the Ashton-Pill path the previous weekend and combined with a run around the harbour I had managed about 26km. My Garmin ran out of battery at just under 10km. I had been running at just over 7 minutes a km so I ran for 25 more in the direction of Pill and then turned and retraced my steps. My plan was the same as that previous weekend, I would run half way and then run the same way back. I felt energetic enough to add extra kilometres in before I got to the path but didn’t think I’d be able to do it at the end. I started by circling the harbour and instead of crossing over to Coronation Rd I ran down past the Louisiana on Wapping Rd, turned in on Princes Wharf, passed the Olive Shed and the crowds around Brunel’s Buttery and ran down to just before the SS Great Britain and then back to Cumberland Rd. The day was Easter Sunday, it was sunny and pleasant and there were a lot of people enjoying their time off. I said thank you many times as I weaved in and out of crowds. I was very proud of myself for feeling so pleasant towards everyone. On the way back, when I was doing the same thing but at the 26km point of my journey I was not saying any words of gratitude. I just wished they would all get out of my way and there seemed to be hundreds more people than three hours previously. The Garmin was charged (unlike the previous week), my meal the night before was carb heavy with brown rice; my breakfast was porridge, yoghurt and a banana. My drink was the raspberry lucozade which tastes just like candy and my ipod was charged (Gaga, Alphabeat, Kings of Convenience and then podcasts on Buddhism towards the end). The only thing I worried about was the muddy path from the rain that fell the previous couple of days. I gave up avoiding the puddles and while I didn’t enjoy seeing my trainers get dirty, I wasn’t going to worry about it during the run itself. The previous week I had started my day with the same breakfast and didn’t finish my bottle of lucozade with a little bit left when I arrived back home. This time I finished the bottle, I consumed one Torq energy sachet and towards the last two kilometres I wished I had more. Next time I’ll be better prepared. For now I’m happy with the run and the views were incredible, the fields and the trees, the Avon and running underneath the Clifton Suspension Bridge and looking up. I could have kept going past 29km and the only thing to mar the experience was a swollen toe which kept me away from running for three days. Ibuprofen and rest made it better but I now have two black nails on my left foot. I am hoping for one more long run within this week and then I’ll wind it down. I know that others have already run their longest run but with my delays and lost training I am going to have to adjust. 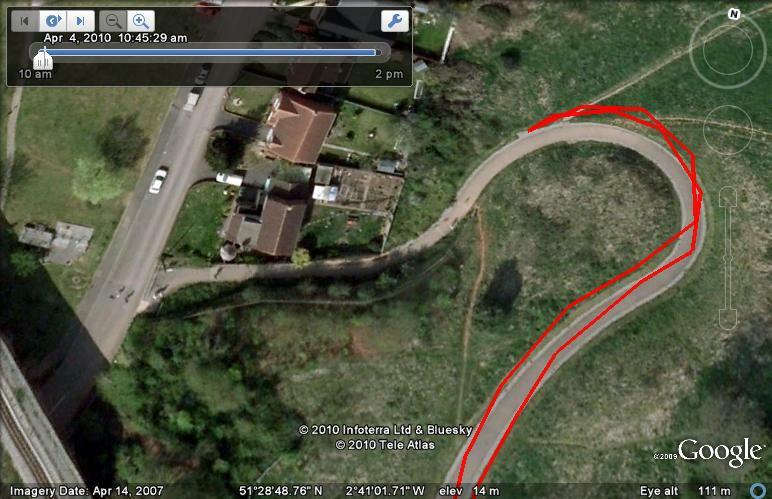 Looking at the route I ran on Google Earth I am so impressed with the technology that allows me to have such information available so readily. 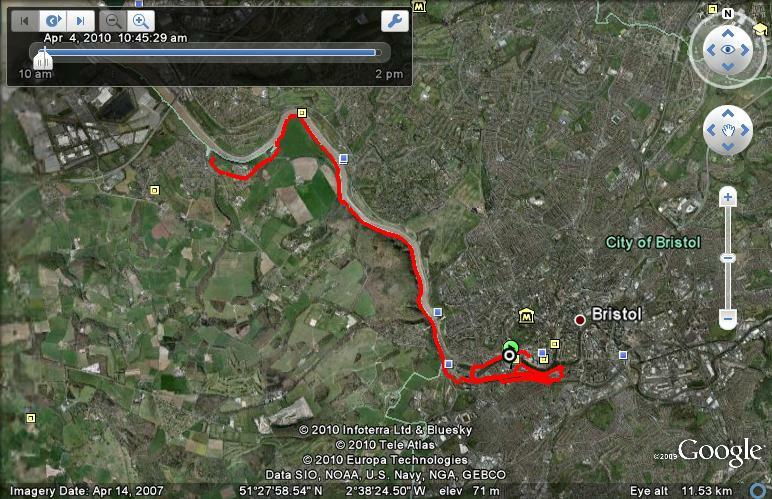 This entry was posted in Bristol, Running and tagged Ashton, Bristol, Clifton Suspension Bridge, Garmin, Google Earth, London Marathon, path, Pill, Running. Bookmark the permalink. Great run! I was at the Clifton Suspension Bridge the other week, and those running both over and under it knew they were part of an amazing experience. My own 20 mile run was less successful (though my ultimate target is Edinburgh this year) but you should be really encouraged by yours. Good luck in the London Marathon! It was! Thanks for the comment Kusasi. Why was yours less successful? 20 miles sounds pretty good. Good luck with Edinburgh, I would love to try that one as well. Oh nothing major – just ran out of juice between miles 15 and 16! My usual problem. I still have more time to work on my endurance though so here’s hoping. I ran London last year, it was incredible. I know you’ll love the experience. Fantastic run! I have to say, that is my usual going-for-a-bimble cycling route, up along the docks, out towards Pill, up over the flyover and back down on the other side of the Avon along the trail. So I even more impressed that you run (roughly) that route.